While rights to set up and configure the grade export system must be granted to an individual, all principals, assistant principals, selected staff members and system admins have rights to view the status of submissions for a current or past marking period. This information can be used by any personnel members wishing to obtain a printable report of all grade submissions. 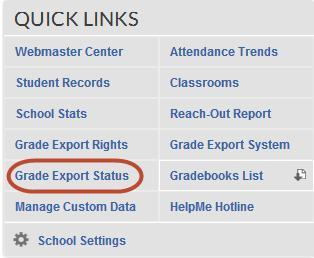 Click the Grade Export Status link. The Export Status screen also lists all active teachers in two columns: teachers listed in the right column have submitted grades. Those in the left column have not. Use the Email All Below button or the individual email icons to send LoopMail reminders about when grades are due. Check the teachers you want to generate a report for or click the Check All button to check all teachers. When finished, a user successfully obtains a printable report of all grade submissions for any selected teachers.